A Cinch. Says Boss Croker to Boss McLaughlin: "Shake!" A bird's-eye-view of New York and Brooklyn. 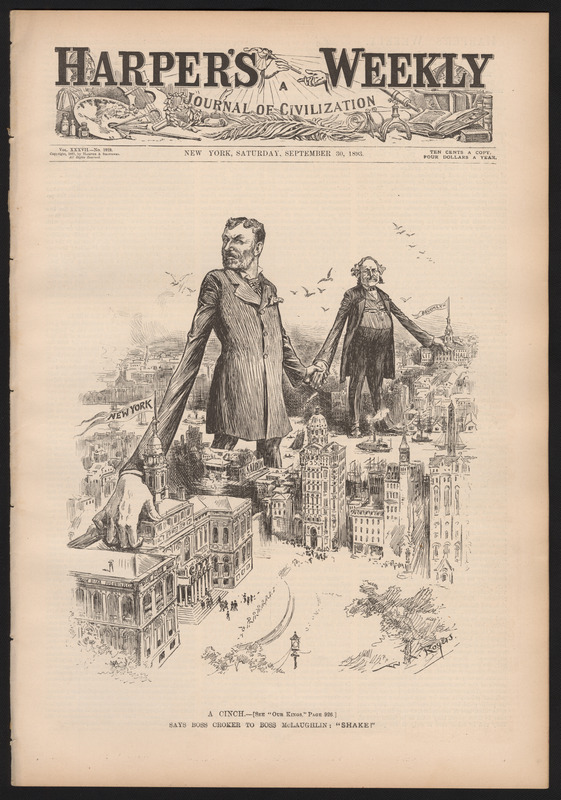 The boss of Tammany Hall in New York, Richard Croker, and the boss of the Brooklyn political machine, Hugh McLaughlin, reach across the East River to shake hands in cooperation. Each is anchored by a hand firmly grasping his respective City Hall, and together they mirror the iconic Brooklyn Bridge, then just 10 years old. The editorial text (p. 926) compares the two to the absolute monarchs of England in the 17th century, and derides the "fixed system of despotic rule . . . in each of these nominally democratic communities." Harper's Weekly (vol. 37 no. 1919) 30 September 1893. Print.